The Battle of the Labyrinth (Percy and Annabeth). Scene: Percy hugs Annabeth after asking for the last line of the prophecy.. HD Wallpaper and background images in the The Heroes of Olympus club tagged: percy annabeth last line battle of the labyrinth percy jackson the heroes of olympus. I love this moment! What is this I am feeling now? Oh wait, its longing for them to be together! Jeez RR, you really knOw how to get fans being really into the book that they pity them for their sadness! Its just sooo sad! I...miss...seaweed brain....and...Annabeth...so...fricken...b­ad! :( please come home!! i am going to have a phsycotic breakdown I'M DIEING OVER HERE!! I agree with all of you! 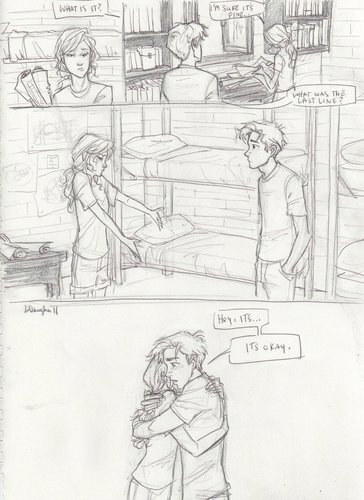 Omg i miss Percy and Annabeth SOOOO much. I MISS PERCY AND ANNABETH!!!!!! so freakin' cute! sweet! romantic! I LOVE it!!!!! Was that is the book cause I don't remember it??? If it is what page??? But still cute!!!! Duh it was in the book it was in the battle of the labyrinth before they went on Annabeth's quest! YOU HAVE TO GIVE CREDIT TO BURDGE BUG, THE ACTUAL ARTIST OF THIS!!!!!! Evah heard of copyright? AW! Love this! Wish the Mark Of Athena would come out soon. I read this over and over... stupid Malcolm! What the heck is Percy looking at in the last panel? That is not the best scene in the book! ): On page 203,paragraph 9, 23, 24 25 words, it EXACTLY says "She kissed him". I know what your`re thinking. I know I`m wierd.But I`m not crazy!